We will hold two sessions of our Summer Clinics. We anticipate that all spaces will fill up as they have the past many years. ​RYS favorites Adriano Torriani, Andrew Schuck, Colin Moses, Steve Burnstin, Erica Stewart, Adam Kent, Michael Konicoff, Prince Danso, and others; new guest coaches and former Rye players who now play at a variety of D-I and D-III colleges and universities; dozens of current and former Rye Varsity standouts who serve as assistant coaches for the week! Approximately 1 Head Coach and 2 Assistants per 10 Campers. Each night features two 25-minute instructional sessions (players are grouped according to age and gender), an exciting skills competition, and two World Cup matches (co-ed) leading to the quarterfinals, semifinals, and finals that take place on the last evening of camp. All campers will receive a t-shirt, and there will be several nightly prizes and trophies awarded for sportsmanship and skills competitions! 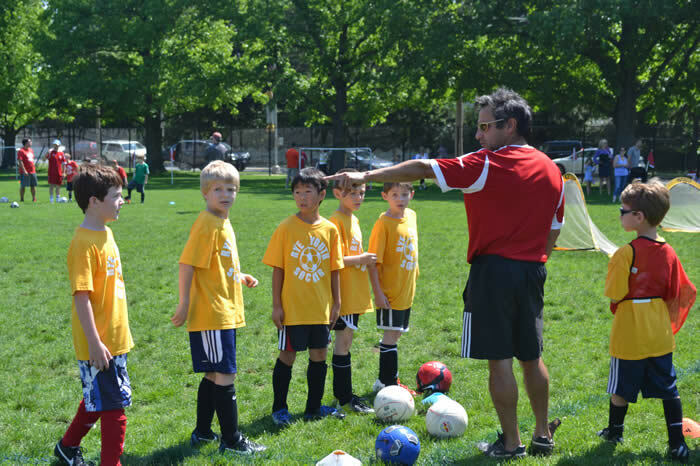 3:40-4:05 : Technical Session #1: Dribbling activities designed to promote comfort, ease and creativity with the ball. This session ends with skill-specific games. ​4:10-4:35 : Technical Session #2: Shooting exercises designed to instruct fundamentals of a powerful, accurate strike of the ball . This session ends with skill-specific games.